A very serious human health risk. 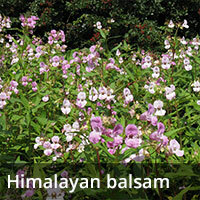 Invasive weeds include Japanese Knotweed, Giant Hogweed, Himalayan Balsam and Rhododendron Ponticum to name but a few. They all spread quickly and out-compete the local native plants which is why they’ve become an issue in the UK, and they’re not easy to get rid of. How can you resolve the issue? The place to start is generally with a site survey, until we know the extent of the ‘invasion’, we find that discussions and estimates for solutions are largely speculative. If you want more information feel free to send over details, we will treat them confidentially, provide a survey price, and list potential options based on the information you’ve provided. If you already have a survey, we’d welcome the opportunity to put forward a proposal to solve your problem(s). We’ve also had good success with weed barriers, however we find it more straight forward to discuss these in context than describe them here. What are invasive species? They’re known as invasive species because they were introduced into this country from other ecosystems and due to the lack of natural predators or disease have been able to spread and out compete native plants. This has the effect of reducing biodiversity, impacting upon the environment and devaluing and damaging property in the process. 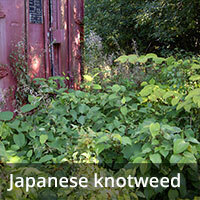 Why are plants like Japanese Knotweed and Hogweed a problem? They are a problem because Japanese Knotweed and Giant Hogweed are difficult to kill, can spread rapidly and if excavated and removed from site, soils containing viable plant material must be treated as controlled waste. Japanese Knotweed spreads vegetatively (by growth or movement of live plant material by human action or natural causes such as being washed along water courses) and can regenerate a new plant from fingernail sized fragments of rhizome (root). Crowns (the lumpy bit at the base of the stalks) and green stalk material can also re-grow to form new plants. The plant grows very quickly (up to 40mm a day!) and can damage physical structures such as buildings and pavements, it laughs at tarmac and grows through and widens cracks and weaknesses in concrete. It also out competes and damages existing natural ecosystems and when the stalks die back in autumn the resultant build up of dead and plant material can contribute to flooding problems and offers a habitat for vermin. Giant Hogweed presents a risk to human health with sap that on contact makes skin photoreactive leading to painful blistering and severe skin irritation resulting in purple black scars. Symptoms of this can persist for years after exposure. Giant Hogweed spreads from seeds, and a single mature plant can produce up to 50,000 of them which will commonly remain viable in the soil for 7 years but have been found to be viable after 15 years. Why do I have to do something about it? 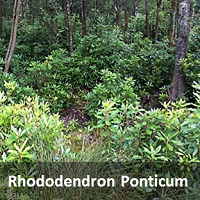 Under the section 14(2) of the Wildlife and Countryside Act 1981 (England & Wales) or Natural Environment (Scotland) Act 2011, it is an offence to ‘plant or otherwise cause to grow in the wild’ any plant listed in Schedule 9, Part II. This includes Giant Hogweed and Japanese Knotweed. This means that although it’s not illegal to have these species on your land you are responsible for preventing their spread from your land. Given the spectacular abilities of these plants to spread, particularly if they are disturbed during site development works it is a really good idea to seek professional advice rather than risk prosecution and a sizeable fine by inadvertently spreading the problem both on and off your site. It’s also worth bearing in mind that invasive plant species on your site is a problem that will only get worse with time, without human intervention it is extremely likely that these plants will simply continue to spread. You’ll find interesting facts at our blog here.